Jason has been with Upstate Refractory Services, Inc. since 2002 when the company was first established. He is a graduate of SUNY Oswego where he was a Public Relations major. He has worked in all parts of the company, including installation, manufacturing, production, and sales. In his role as Sales and Marketing Manager, Jason continues to serve his current customers, build new customers and lead the sales team toward overall growth while working closely with website design and marketing materials for the company. Jason is a great resource for our team and our customers, has a vast knowledge of refractory materials and techniques, and is a true leader in our company. Bryan graduated from Newark High School in 2002. Afterward, he went to Alfred State earning his Associate's Degree in Applied Science in 2005. After college, Bryan worked as an auto tech before joining the Upstate Refractory Services, Inc. team. Bryan started out as the Warehouse Manager, which included controlling inventory, pulling orders for both in house work and field construction jobs, fulfilling materials sales orders for customers, and arranging logistics for shipping. About 2 years ago, Bryan became the Production Manager for the in house services at Upstate Refractory Services, Inc. He is in charge of the fabrication, fiber, form, and cast departments , and manages the dryout and product completion schedules. He believes in a hands on approach with training that helps people understand how things work and why it's done a certain way. He manages up to 30 people to strategically and seamlessly complete customer orders on schedule. He has a way to listening to all ideas and incorporating research and development to continually improve quality as well as streamlining processes. Its amazing how little changes make such a big difference. Bryan is a great leader and motivator for our production crew. At Upstate Refractory Services, Inc. we feel that our employees are our most valuable asset. Over the next few weeks, we will be introducing our team members. Stephanie is a graduate of Alfred University, School of Engineering. Her background in engineering, quality control, and hands on production made her a perfect fit in our company. In her role as a Process Engineer at Upstate Refractory Services, Inc., Stephanie helps to design, draw, and estimate projects for customers. She oversees the quality control program within the company and helps to guide workflow in our manufacturing shop. Stephanie has been a quick learner in our niche organization and her eye for detail makes her a great asset for our team. Upstate Refractory Services of Newark, NY Acquires Hanyan-Higgins Company Inc.
NEWARK, NY, MARCH 7, 2018 – Upstate Refractory Services (URS), a full-service contractor, installer and distributor of refractory materials in Newark, NY, announced their acquisition of the assets of Hanyan-Higgins Company Inc., a refractory sales and service business providing services to industrial, commercial and municipal customers for nearly 90 years. Through this asset acquisition, URS will see a significant development in their construction capabilities as well as the expansion into three new locations, including Syracuse, Albany and Massena. Hanyan-Higgins Company Inc. has been a distributor of Plibrico refractory products for over 60 years, and with this acquisition, URS will continue to offer Plibricco across upstate, central, and western NY. Additionally, owners John and Dave Higgins of Hanyan-Higgins as well as the core employees will now work under URS. With this acquisition, URS will have a total of over 300 years of refractory industry experience among employees. As this merger takes place, customers of Hanyan-Higgins will not experience any interruptions in their services. Upstate Refractory Services (URS) has been providing customers with cost-effective solutions to refractory related problems since 2002. Over the years, URS has been specializing in engineered precast refractory shapes, stack bonded ceramic fiber panels used in furnace roofs, walls and doors, refractory relines and repairs, and distribution of refractory materials. Custom design industrial furnaces and control systems are also part of their product offering. Founded in 1929, the Hanyan-Higgins Company Inc. has been providing refractory sales and service to industrial, commercial and municipal customers for nearly 90 years. Having the turnkey capability to provide customers with single source responsibility, they have experience in all refractory installation methods. Keeping sufficient stores of refractories on hand to be able to respond to customers’ immediate needs, their goal has always been to acquire the best equipment in order to provide the best service, which in turn provides customers with the best value possible. The Upstate Refractory Services, Inc. engineering team designed this Pin Heater Furnace. Our team created this furnace complete - from start to finish. This specific pin heater is used for stopper pins in a continuous casting aluminum operation and is designed to run at a temperature of 1100 degrees, which it reaches within 15 minutes. For more information about specific furnace designs and rebuilds, please contact us in our Info section or read more in the Engineering section of the website. On Wednesday, May 24th, students from the WTTC Advanced Manufacturing program toured our facility. While here, they learned a bit about refractories and had a chance to tour our facility, learn a little about what we do, and ask questions about types of careers in our facility. We were excited to be chosen as a manufacturing facility to tour! Thank you for the great day! On Friday, November 4th, we gathered as a company for our Annual Safety Day. We spent the day getting up to date on all of our safety programs and getting re-certified for skills for day to day work. We also received training from Vesuvius Inc about the best ways to properly mix and use materials so we can make the best product with the least amount of waste. Lastly, we split for afternoon sessions to perform respirator fit tests, scissor lift training, and road tests for driving company vehicles. We put safety first as a company and feel it is important to take a day each year to be sure we are as safe as we can be! On Saturday, July 30th, we held our Annual Employee Golf Tournament and Picnic at Big Oak Golf Course in Geneva, NY. We had 30 golfers participate in a scramble style tournament this year. Eight teams played 9 holes of golf. We held competitions for the Ladies' and Mens' longest drives and closest to the pin. The winning golf team consisted of Bryan, Gil, Chuck K., and Bill. They ended the day with a score of 34 and received hats as their prize. The winner of the longest drive for the men was Jason and for the ladies was Allison. The winner of the closest to the pin competition was Mike P. for the men and Krista for the ladies. The men received hats and the ladies received large beach bags with candles and lotion inside as their prizes. The team with the highest, most honest score consisted of Ken and Diane V., Matt and Lori with a score of 45. They received gift cards as their prize. Immediately following the golf was a picnic where employees and their families joined, catered by Big Oak Golf Course. All guests were treated to Upstate Refractory Services, Inc. logo fleece blankets and other various prizes, including gift bags filled with school supplies and fun prizes for the children and teens. We look forward to this annual outing to celebrate our employees and their families! Upstate Refractory Services was selected to design, fabricate and install a new system for an area foundry to preheat their foundry ladles in a controlled and safe manner. The system consists of one single station unit for the larger ladles, and one four station unit for their smaller ladles. The previous system consisted of inspirated gas burners that had no temperature control, no insulation to retain the heat, and high noise levels when in operation. The new system has been on site for a few months and has been performing as expected. The benefits realized include a much lower noise level (less than 70db), the ability to control the heat up rate for drying out new linings,significant fuel savings, safe operation, and reliable temperature measurement to insure that the ladle temperature is correct before use in production. Please call Upstate Refractory Services, Inc if you would like more information on this project. We stand ready to assist your company in solving heat process equipment challenges. Our goal is to exceed your expectations. Upstate Refractory Services selected to supply replacement fluid bed dryer combustion chamber. Following are some photos of a fluid bed dryer combustion chamber. 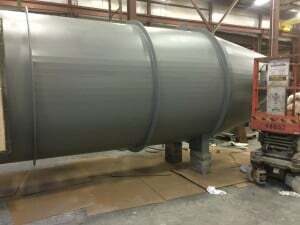 This fabrication is approximately 21′ long and 7’6″ diameter. The unit is lined with Unifrax Anchor Loc II modules and coated with Unifrax Silplate Mass 1500 to protect the modules from erosion due to the velocity of air and particles that move through the chamber. The unit was dried to 300 degrees prior to shipment to set the Silplate Mass and painted prior to shipment. Also included are some stainless steel shields to aid in the protection of the module. We are confident that this will give our customer a reliable solution to their problem. Upstate Refractory Services staff is always ready to work with your company to resolve the tough problems. Give us a call!